The bonnetiere is a tall wardrobe particularly from the Northern area of France and this is a particularly good example. This bonnetiere consists of a cornice to the top leading down to marquetry inlaid decoration with central star design with an inlaid burr elm panel to either side. 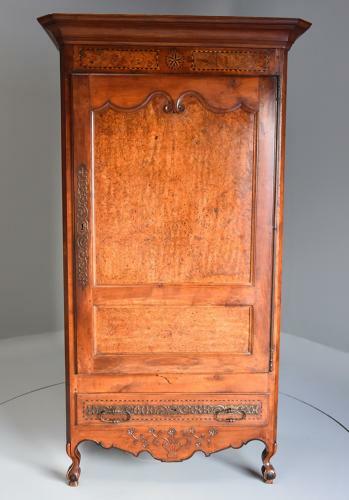 This leads down to the large door consisting of a large superb solid burr elm panel with original fretted metalwork, lock and Z shaped key (the key being a work of art itself) with a smaller panel below, the door opening to reveal a large storage space. This leads down to a single inlaid drawer with superb original metalwork incorporating the original handles and a shaped apron below with carved floral decoration, the small cabriole legs terminating with ball and claw feet with stile feet to the back, the sides being panelled. This piece is in excellent condition for age, is of stable construction and can go straight into a home.